On 5th March Southend held its official opening of its new terminal building, and of its runway extension that is now completed. Local opponents fought a long and hard battle against the runway extension. At present the airport has just one destination airport – Waterford in Ireland. On 2nd April, easyJet flights to bucket-and-spade Spanish destinations start (including Malaga, Ibiza and Mallorca) taking tourists and their money out of the UK. 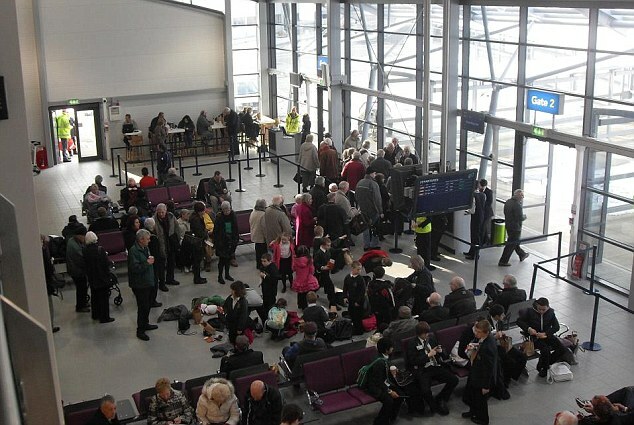 There will be 20-30 passenger daily flights this year, but Stobart hopes to eventually carry up to 2 million passengers annually and plans to extend the terminal further this summer. easyJet came to Southend due to cheaper landing charges than at Stansted. Some passengers will find the empty terminal and the easy train journey from London’s Liverpool Street easier than a trip to Stansted or Luton. Alistair Welch, the CEO, says he expects there to be 500 jobs created at the airport this year. 500? He said 150 last summer. A new passenger terminal at Southend Airport has been officially opened by transport secretary Justine Greening. The £10m building at the Essex airport is the latest expansion by its owners, the Stobart Group, which is aiming for 20 million passengers by 2020. In one small, sunny corner of south-east England, many miles from the congested M4 corridor, is a sight to make the owners of Heathrow weep with envy. Under the benevolent gaze of local parishioners, construction workers finish surfacing a brand-new runway, [runway extension] and – even as it lops off the corner of his churchyard – the vicar is going along to the opening celebrations. Welcome to the ambitiously named London Southend airport, officially reopening on Monday, with a runway now large enough for easyJet’s planes, and set to export the holidaymakers of south Essex and to lure unwary Spanish visitors. Given the opposition airport expansion has faced elsewhere, many in Southend on Sea are astonishingly serene about the development on their doorsteps. A new terminal building gleams proudly opposite the bungalows of Southend Road, close enough for residents to peer from behind the net curtains into departures. The transformation is clear from the green expanses still displayed on Google Earth. Perhaps even more surprising than its renaissance is the airport’s claim to have once been Britain’s third largest, before BAA built Stansted and grabbed all its business. 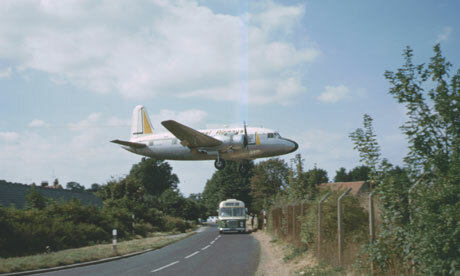 Pathé footage records Southend’s glamour days, when passengers could take their cars to the continent aboard British Air Ferries planes. After decades in the doldrums, with nothing more than a flying club, the odd cargo flight and aircraft coming in for repair, the airport was purchased by the firm of the legendary lorry magnate Eddie Stobart. Welch joined in 2007 with a vision to extend the runway to cope with the demands of flights to the Mediterranean. An investment of £100m has brought a control tower, (“You couldn’t actually see the runway from the old one,” said Welch), a distinctive steel railway station (a £2.70, five-minute journey from the town centre) and a Holiday Inn under construction – the basic infrastructure for Stobart Air to have a fully-fledged international passenger airport on its hands. From 2 April, easyJet starts flying from here to destinations including Malaga, Ibiza and Mallorca, routes to excite the Towie stars who graced the airport’s launch party, where the leader of the council spoke of bringing “jetsetters” from Spain to Southend. Visitors may have reason to be tempted: a 52-minute ride to Liverpool Street station makes its rail connection to the capital roughly equivalent to Stansted’s, but cheaper, and on a line that stops at Stratford for the Olympic Park. The first arrival to reach the new terminal landed shortly after 2pm on its first day of operation this week, an Aer Arran propeller-engined aircraft from Waterford. First off was Michelle Hill, 37, from nearby Benfleet, a competition winner who had departed via the old, fading wooden terminal hut to return to Southend’s bright future. “Really nice,” she said. “Most people are into it – it’s creating jobs, bringing tourism.” Did she think they would really be heading here from Spain? “Yeah, why not? We’ve got a lot to offer: doorstep to London, the town centre, a beach, the pier.” Although, she conceded, the pier has been closed since a fishing trawler crashed into it last month. Only 10 passengers had yet troubled the check-in attendant, who sat waiting for standby passengers on the day’s only departure, back to Waterford. A well-heeled Irish couple eventually ran through, boarding with just 15 minutes to spare. They had been on holiday in London – and this was a lot easier to deal with than Heathrow, the woman explained. Although its limited destinations don’t yet allow duty-free, the manager of the airport store – stocking Eddie Stobart memorabilia alongside obligatory Toblerones – said they had were already exceeding sales targets. Despite a tortuous process of consultations, planning appeals and aborted judicial reviews, he says there has never been the full public inquiry and independent scrutiny a development such as this deserves. Southend will have 20-30 passenger daily flights this year, (see below )but Stobart hopes to eventually carry up to 2 million passengers annually and plans to extend the terminal further this summer. It used to be Britain’s third busiest airport and a roaring travel hub during the golden age of commercial flight… until London Stansted opened its gates and took all its business. Since then, the ancient runway at Southend Airport has been lying almost dormant, but for the odd cargo flight and hobby-plane from its resident flying club. But the airport, that used to ferry hundreds of British holidaymakers across the Channel every day, is set to return to those glory days once more thanks to a £100 million makeover. and it continues ………… much as the article above. 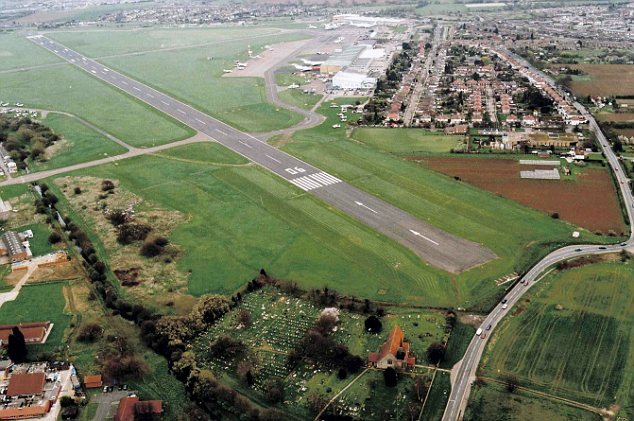 Simple: Southend Airport before the revamp. Managers hope to see two million holidaymakers a year pass through its gates. The church is in the foreground. EASYJET will start operating from London Southend Airport from April 2012, with the creation of 150 new jobs. The 10-year agreement between airport owners Stobart Group and the UK’s largest airline will see three A319 aircraft based at the Essex terminal in summer 2012. There will be 70 easyJet flights per week and passengers will have a choice of around ten different European destinations including Barcelona, Faro and Ibiza. Tickets will go on sale at the end of July. The new jobs will be a mixture of cabin crew, pilots and ground staff. London Southend Airport’s managing director, Alastair Welch says “We are delighted to announce our partnership with EasyJet, servicing a comprehensive variety of routes into Europe and hot on the heels of other significant developments at London Southend. EasyJet’s Customer and Revenue Director Catherine Lynn added: “We are excited to be opening London Southend as easyJet’s 20th base airport. This is a unique opportunity to offer a world class customer experience, with passengers able to get from the plane to the train in 15 minutes. “Through offering easy and affordable travel, we expect the new routes to appeal to customers in Essex and London looking for a convenient new departure point for many top European destinations. Posted: Monday, March 5th, 2012. Filed in News about Airports, Recent News.